There are a few reasons why this recipe is just right for tonight. The first reason is that it’s early summer in San Francisco and it’s freezing. Not literally, but enough to feel obliged to apologize profusely to visitors from out of town. Enough to don fleece outerwear to venture out to the grill, where hands are briskly warmed between flipping the burgers. Or enough to appear like it’s raining when technically it is not, but the mist from the fog is so heavy it soaks the garden furniture and leave puddles on the steps. Another reason why this meal is just right is this is the first day following a whirlwind celebratory week of graduations, house guests and parties. When lists were made to remember lists. When we had great fun, but didn’t have a moment to reflect on that fun. When we indulged and consumed and quite likely forgot to eat our vegetables. Today we now have the time and space to remember and to reflect – and to also eat a balanced meal. This recipe corrals the seasons’ best farmers market produce, hearty farro, and a few lone pieces of steak left over in the fridge, in one big warming yet fresh meal brimming with health and good flavor. You can grill the steak or pan fry it, depending on the weather. Shelled English peas or edamame may be substituted for the garbanzos. Preheat oven to 375°F (190°C). Toss the beets and onion with 1 tablespoon olive oil. Season with salt and pepper. Bake in oven until beets are tender and onions are beginning to brown, about 45 minutes. While the vegetables are roasting, prepare the farro: Combine the stock, farro and 1 teaspoon salt in a medium saucepan. Bring to a boil, then reduce heat to a simmer. Cover and cook until the farro is tender but still chewy, about 30 minutes. Remove from heat and fluff with a fork. Stir in 1 tablespoon olive oil, garlic, paprika, cumin and cayenne. Partially cover to keep warm. Prepare the steaks: Season the steaks all over with salt and pepper. Heat 1 tablespoon olive oil and 1 tablespoon butter in a heavy skillet or cast iron skillet over medium high heat. Add steaks, without overcrowding, and cook until brown on both sides, turning once, 6 to 8 minutes for medium rare. (or grill over direct high heat, turning once or twice, 6 to 8 minutes. Transfer to a cutting board and let rest 5 minutes. Cut steaks crosswise in 1/2 inch thick slices. While the steaks are resting, bring a small saucepan of water to a boil. Add the garbanzos and blanch until bright green but still crisp, about 1 minute. To serve, spoon the farro into the center of a serving platter or divide among serving plates. 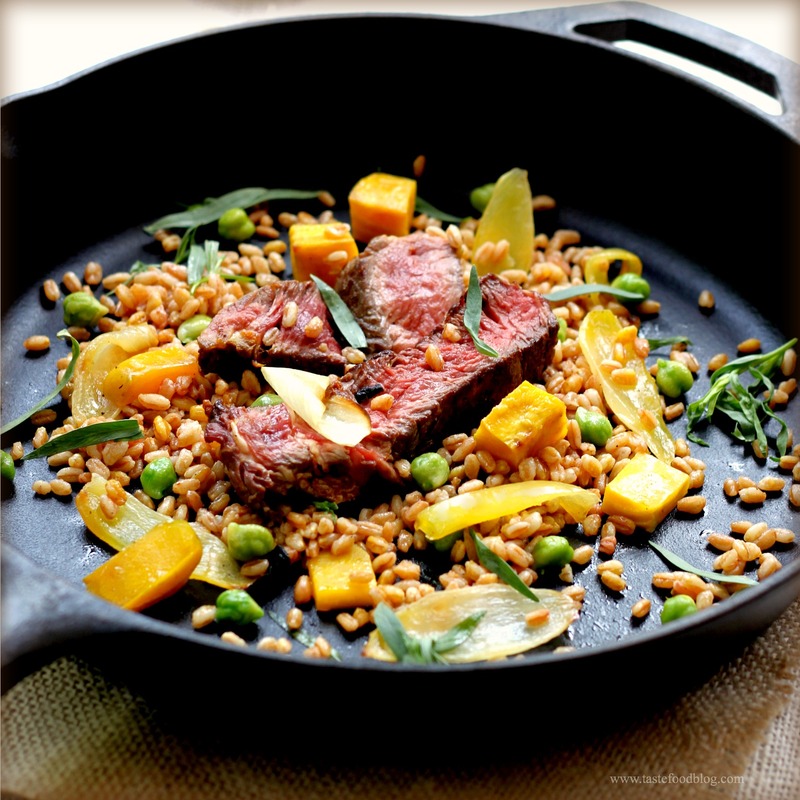 Arrange steak in the center of the farro and drizzle with any accumulated juices. Place the vegetables around the steak and drizzle with any accumulated baking juices. Scatter the garbanzos over. Garnish with fresh tarragon. Drizzle with more olive oil. Serve warm with Sriracha sauce on the side. It’s safe to say that everything I bought today at the market ended up in this dish. Sweet onions, golden beets and fresh chickpeas vied for my attention this morning at the farmers’ market, so I did what any sensible person would do. I bought all of them. Moving on to the local ranch’s stall displaying their glistening meat, I continued my spree and snagged 2 seriously soft and richly marbled rib eye steaks, each weighing in at nearly 1 pound each. I wasn’t sure exactly how I would put our dinner together, but I knew it would be magnificent with these fresh and earthy ingredients. Preheat oven to 375 F/190 C. Toss the beets and onion with 1 tablespoon olive oil. Season with salt and pepper. Bake in oven until beets are tender and onions are beginning to brown, about 45 minutes. Prepare the steaks: Season the steaks all over with salt and pepper. Heat 1 tablespoon olive oil and 1 tablespoon butter in a heavy skillet or cast iron skillet over medium high heat. Add steaks, without overcrowding, and cook until brown on both sides, turning once, 6 to 8 minutes for medium rare. Transfer to a cutting board and let rest 5 minutes. Cut steaks crosswise in 1/2 inch thick slices. While the steaks are resting, add the fresh chickpeas to the skillet and briefly saute over medium heat until their color brightens, 1 to 2 minutes. To serve, spoon the farro into the center of a serving platter or divide among serving plates. 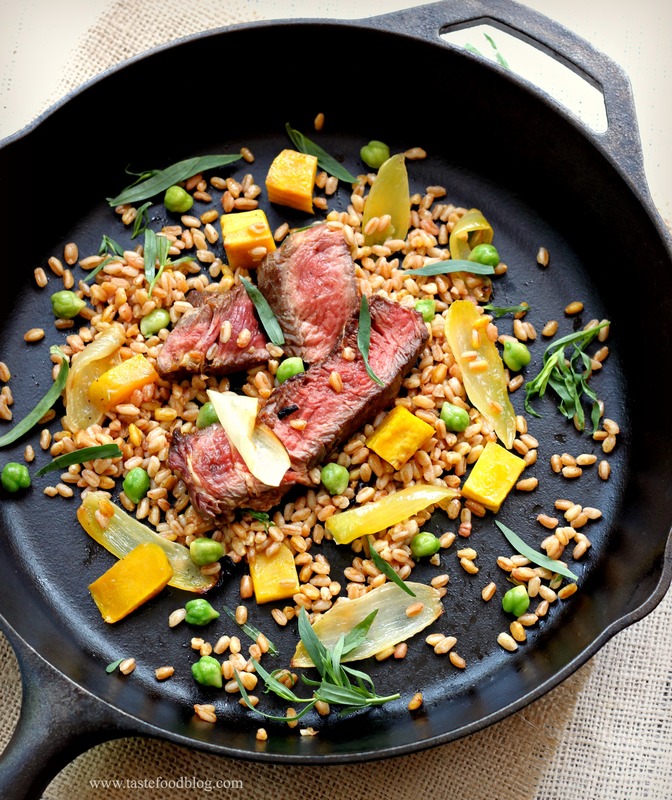 Arrange steak in the center of the farro and drizzle with any accumulated juices. Place the vegetables around the steak and drizzle with any accumulated baking juices. Scatter the chickpeas over. Garnish with fresh tarragon. If desired drizzle with more olive oil. Serve warm with Sriracha sauce on the side. This morning, in honor of Mother’s Day, we went to the farmers market with the satisfying intention of purchasing ingredients for our dinner. Beautiful New York strip steaks were on display and immediately went into our basket. Asparagus, shitake mushrooms, strawberries, peas and fava beans quickly followed. Our final purchase was a bunch of garlic scapes, impossible to pass by, as they feistily vied for attention, announcing their assertiveness – if not in taste, than in their spiky shape. Garlic scapes resemble an oversized chive with a bulbous flower at the end. The stalks are firm with a peppery bite and mild garlic flavor. They are wonderful in a stir-fry, because they retain their crispness, and impart a mellow, garlicky flavor. The flowers are edible and, when cooked, have a somewhat astringent and earthy flavor. When we arrived home, I made a paste of garlic, rosemary, sea salt and olive oil and smeared it all over the steaks to marinate in during the afternoon. While they stewed in garlic and rosemary, I prepared a stir-fry of Shitake Mushrooms and Garlic Scapes to serve over the steaks as a fresh garnish, along with grilled asparagus, new potatoes and fresh strawberries and cream for dessert. I can’t think of a better Mother’s Day celebration. Combine garlic, rosemary and salt in a mortar with a pestle. Smash the garlic and bruise the rosemary. Mix in the olive oil and black pepper. Rub the oil all over the steaks. Cover and refrigerate for several hours (can be prepared up to 24 hours in advance.) Remove from refrigerator one hour before grilling. Grill the steaks over a hot fire, 5 minutes per side for medium-rare or to desired doneness. Remove from grill and place on cutting board. Cover loosely with foil and let rest 10 minutes before carving. Heat olive oil over medium heat in a skillet. Add garlic clove and sauté until fragrant. Add garlic scapes and sauté 1 minute. Add rosemary sprig and shitake mushrooms and sauté until mushrooms release juices and turn golden brown. Add stock and deglaze pan. Add soy sauce. Add salt and pepper to taste. Remove and discard rosemary sprig. Arrange steaks on serving plates or platter. Spoon the shitake and garlic scape stir-fry over the meat. Garnish with rosemary sprigs. I love French Bistro cooking; it makes me very happy. In fact, bistro cooking should make all of us happy. It’s comforting, generous, convivial and unpretentiously rooted in French tradition. How can anyone not like that? I became familiar with bistros while living in Paris and Geneva for 10 years. Found in every neighborhood, the bistro was the go-to restaurant for consistently delicious food. Welcoming, bustling and casually elegant, the bistro was home away from home: soothing in its predictability, its well-worn ambience and its dedicated timelessness. Now, years later, there isn’t a bistro in our neighborhood, but it’s the cuisine I seek out in restaurants and enjoy making at home. Skirt steak with shallots or Bavette aux Echalotes is a classic item featured on bistro menus. The less expensive and very tasty cut of meat is pan-fried on the stove and then served heaped with sautéed, caramelized shallots. It’s quick to prepare, delicious to eat and economical on the wallet. Perfect bistro fare. At the risk of repeating myself, I will tell you that I love French bistro cooking. Simply put, it makes me very happy. In fact, bistro food should make all of us happy. It’s comforting, generous, convivial and unpretentiously rooted in French tradition. How can anyone not like it? I became familiar with bistros when I lived in Paris and Geneva. Found in every neighborhood, the bistro was the go-to restaurant for consistent, delicious, and fun food. Welcoming, bustling, and casually elegant, it was home away from home – satisfying and soothing in its predictability, its well worn ambience, and its dedicated timelessness. Now, years later, there isn’t a bistro in my neighborhood, but I do seek it out in restaurants and cook bistro fare at home. It’s perfect for entertaining and families, and since my family was raised eating bistro food in Europe, it’s one of our preferred cuisines for home cooking. So, needless to say, I was very excited when Johanna at the Passionate Cook announced Bistro Food as this month’s theme for the foodblogging event Waiter There is Something in My… (or WTSIM) – I knew I couldn’t miss it. Skirt Steak with Sautéed Shallots or Bavette aux Echalotes is a classic item on bistro menus. The less expensive cut of meat is pan-fried on the stove and then served heaped with sautééd, caramelized shallots. It’s quick to prepare, delicious to eat and economical on the wallet. In honor of Mother’s Day I purchased some beautiful New York strip steaks at the market. At home, I made a paste of garlic, sea salt and olive oil and smeared the steaks all over with the paste. While they marinated, I prepared a stir-fry of shiitake mushrooms and garlic scapes which was a perfect accompaniment to the grilled steaks. Elephant garlic scapes resemble an oversized chive with a bulbous flower at the end. The stalks are firm with a peppery bite and mild garlic flavor. They are wonderful in a stir-fry, because they retain their crispness, and impart a mellow, garlicky flavor. The flowers are edible and, when cooked, have a somewhat astringent and earthy taste. With the shitakes I used the scape stalks and saved the flowers for another use – perhaps in a decorative context. Combine garlic, salt and rosemary in a mortar with a pestle and smash together. Mix in the olive oil and black pepper. Rub the oil all over the steaks. Cover and refrigerate for several hours (can be prepared up to 24 hours in advance.) Remove from refrigerator one hour before grilling. Heat olive oil over medium heat in a skillet. Add garlic clove and sauté one minute. Add garlic scapes and sauté 1 minute. Add rosemary sprig and shitake mushrooms and sauté until mushrooms release juices and turn golden brown. Add stock and deglaze pan. Add soy sauce. Add salt and pepper to taste. Remove and discard rosemary sprig. Serve alongside or on top of grilled steaks. Garnish with rosemary sprigs.